All of the rinks offer rent of skates. The prices vary from 20 to 45 UAH depending on the place and time. There is a nice bar where you can have coffee with cognac after skating. 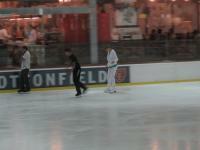 From time to time ice shows take place on this skating rink. * On summer they don't have schedule so it is better to call them before going there. A big rink surrounded by glass walls so any visitor of the trade center can enjoy your skating :). The ice is worse than on the rest of rinks. Nice atmosphere, french music and cafe right near the rink make this place extra popular among couples with children and teens. If you are not that good in skating you can ask a personal trainer to help you.